New York (July 23, 2014) – ATOMIC and WorldStage once again partnered on the upfront for Turner Entertainment Networks’ TBS and TNT, which returned to The Theatre at Madison Square Garden with a bang. Or maybe it was a “Boom” as TNT launched a new, edgier tagline for its drama programming, which includes the new “The Last Ship” from Michael Bay and “Murder in the First” from Steven Bochco. 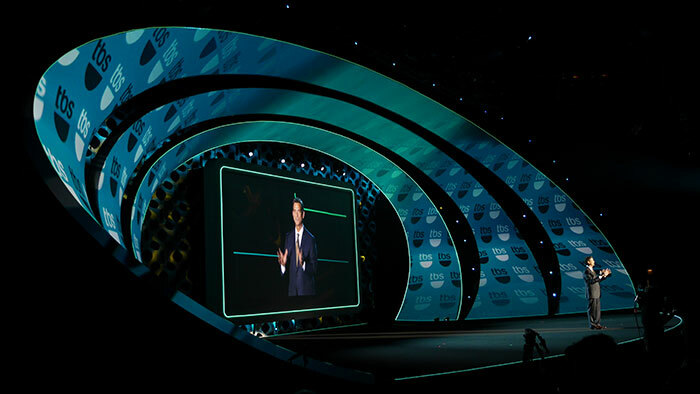 ATOMIC has been producing Turner Upfronts for more than a decade and was responsible for the lighting, rigging, production design, staging and set fabrication for this latest presentation to marketers and advertisers. For many of those years WorldStage has worked alongside ATOMIC supplying critical video support to various New York City venues. ATOMIC was tasked with “creating an environment through scenic, video, lighting and audio that could be transformed from one brand to the other, from one message to the other,” as the comedy and drama networks introduced new and returning shows and their stars. The stage at Madison Square Garden featured a single big rear-projection screen, which featured informational content about the networks’ upcoming seasons. ATOMIC entertained the idea of using an LED screen but opted for a “high-quality rear projection solution with lots of lumens” to deliver the content. Surrounding the screen was a band shell-style series of concentric aluminum arches, clad with neutral gray fabric, onto which WorldStage warped decorative video elements. A Pandoras Box media server drove Christie Roadster HD20K-J and 10K-M projectors. The HD10Ks were embedded in the show deck and pointed straight up at the arches, one of the more unusual projector placements for a one-time event. WorldStage provided six Sony HD cameras, which fed a Ross 4 ME switcher for IMAG and capturing the upfront for a live-streamed webcast and a simulcast on tape delay targeted to advertisers and agencies in Chicago, Detroit and Atlanta. A final cut of the event was made for archiving and for distribution to Turner’s sales and marketing groups. West notes that “One of the great things about this project is that Turner Entertainment recognizes the value of preparation, so we were able to involve WorldStage earlier than we typically would on other projects – about three or four months out. Then things got really involved about one month out. At WorldStage Dennis Menard was also a project manager, Mike Alboher EIC and Encore operator, Pete Cerreta playback operator, August Yuson camera EIC, Alex Donaldson projectionist, John Denion APM and Ryan Eysner, Shannon Robinson and Pete Sokov utilities. In addition, camera operators were provided by Slate.TV, LLC and Locals One and 306 furnished crew.